I really hate that I’ve taken so long to give a recap of ZOOMA Cape Cod, but I’ve finally had the time and the photos to share my full recap! 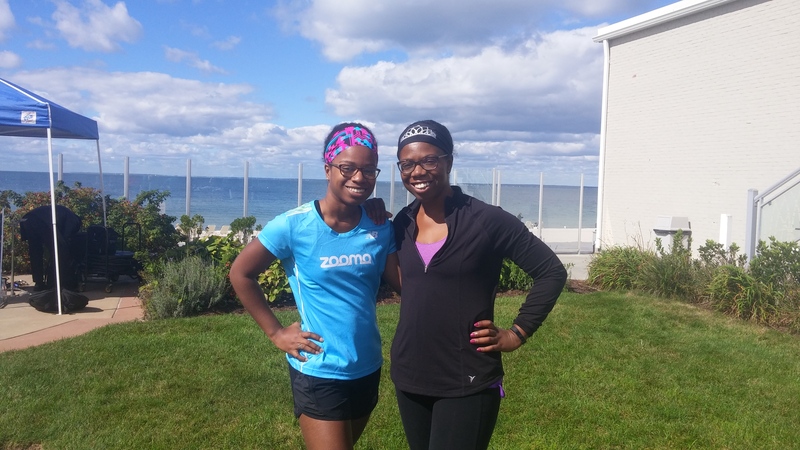 From September 23-25, my sister and I drove to Falmouth, Massachusetts for the ZOOMA Cape Cod Yoga and Fitness Weekend. What originally was going to be a half marathon and 10K weekend was transformed into a more laidback getaway with yoga and the option to run. But I’ll get more into that a little later…keep reading! I’m linking up with Patty, Marcia, and Erika for Tuesdays on the Run, Jen, and Michelle for Wild Workout Wednesday and Susie, Debbie, Lora, and Rachel for the Running Coaches Corner! 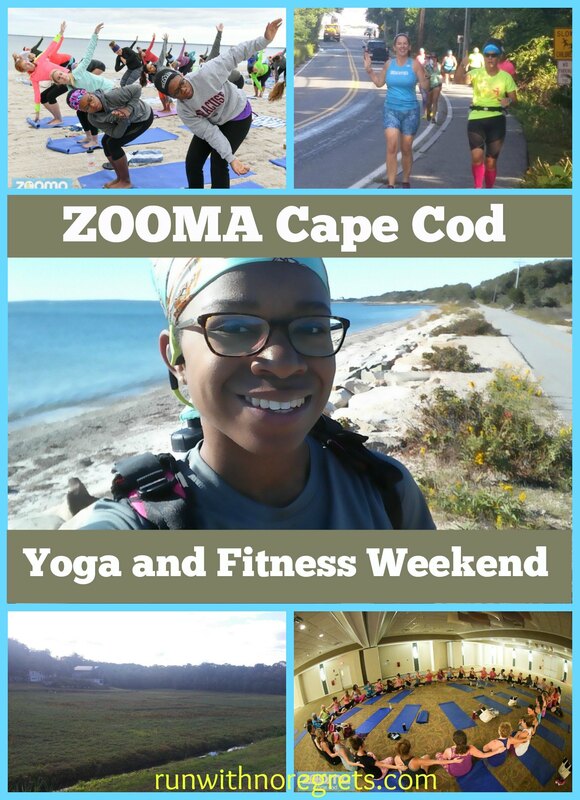 Disclaimer: I am a ZOOMA Ambassador, meaning that my registration to ZOOMA Cape Cod was free. I did pay for my own travel and accommodations. All opinions are completely honest! I was really looking forward to a getaway to Cape Cod with my sister for a fun girls’ weekend. Jennifer lives in Maryland, so she drove up to Philly on Thursday night so we could head on the road early on Friday morning around 6 am for the long drive to Massachusetts. First, let me give a little background on this event. ZOOMA has held a half marathon and 10K in Cape Cod for the past 5 years in late September with great success. I was so pumped to sign up for Cape Cod and experience it for myself! Unfortunately, in June we received an update that the town of Falmouth would not give ZOOMA a permit for the races. So things had to change. The event could no longer be an official race, so it was transformed into a Yoga and Fitness weekend. Runners who signed up for the half marathon were changed to VIP attendees and would run a 10K, while those who signed up for a 10K were changed to regular attendees and would run a 5K. All runners would be able to place themselves into pace groups and run together. Honestly, I was bummed because I was looking forward to running a half marathon in Cape Cod, but it turns out I pretty much had that experience anyway, LOL! The weekend would now be more relaxing and have a lot less pressure, so we were still excited to attend! Since I’m an ambassador, I volunteered to assist ZOOMA co-founders Brae and Brooke with registration on Friday afternoon. Our hotel room was literally right around the corner from where registration was taking place, so that was super convenient. We collected our copious amounts of swag (including as many BondiBands as we wanted) and got more details about the weekend. I met a couple of the other volunteers, Judy, and La Vern, who were extremely nice! Running routes and directions for the 10K and 5K were provided in handouts for the group runs. There was also a private Facebook group created for ZOOMA Cape Cod for all attendees to connect, share photos, and ask questions. Apparently, the previously planned pace groups were no longer possible, so attendees had to create their own groups and could use the Facebook group to organize. Eventually, I started checking people in on the laptop so it was a nice way to get to briefly meet the ZOOMA attendees. Soon after, Mary Beth from Tutus and Tennies arrived and started helping out as well. It was so nice to finally meet! There were lots of women of different ages who were all looking forward to a fun weekend. There were definitely a few who weren’t aware of the changes to the weekend, but overall people were in a good mood. As the time got later, things really started to get busy and I continued to help out until it was time to get ready for hip-hop yoga. Those with VIP registration (who originally signed up for the half marathon) were given access to the hip-hop yoga class. I had NO idea what to expect…would we be pop-locking in downward dog? It wasn’t too different from your typical yoga, except you had much more danceable music and we “flowed” with a lot more rhythm. There were definitely a lot of uncomfortable people in the room, but I think most started to embrace the idea of leaving their comfort zone and by the end of the class had a lot of fun. I had a really good time with it, and it almost seemed more like a Pilates class than a yoga class, but I appreciated the workout after being in a car for so many hours. My sister didn’t have VIP, so she missed out and instead got to enjoy a gorgeous sunset at the beach. There was also a Happy Hour that overlapped yoga, but by the time we went, the scene was dead and there wasn’t any food…so we enjoyed some extra wine before having dinner at Red’s, the hotel restaurant. I had to go for the lobster roll…worth it! At 7 am, it was time for yoga on the beach, which I was really looking forward to. Am I the only person who really loves doing yoga outdoors? Apparently, we were running a little late because most of the good spots on the beach were already taken. It was a bit humorous to me that we were all wearing hoodies and sweatshirts while on our mats, but it was chilly out there! We had a really nice practice, very relaxing and “gentle”. I always seem to carry tension in my shoulders and neck, so it was good to work on those areas. We also took some pictures at the beach after yoga. The water was much warmer than I thought it would be! I almost didn’t want to head out on a run since I was so relaxed! But before I knew it, it was time to get ready for the 10K run. I have to admit that it was a little awkward trying to get a group together to run the 10K. I sent out a message to the Facebook group that I would be heading out around 8:30 but when I went to the lobby I didn’t see anyone. Eventually, I found some smaller groups that were heading out and joined in. Mary Beth was out there as well. We were both wearing our ZOOMA ambassador T-shirts. There were two 10K routes, one heading right and one heading to the left out of the hotel, so we followed everyone going to the right. I was really worried about the group run because there were no longer pace groups taking place, and I know that Jennifer was looking forward to being part of a group at her pace. We started out together on the route, but it wasn’t long before she told me to go ahead. There were some other ladies in the back as well, so I hoped that she would hook up with them. There were a few runners ahead of me, including Mary Beth, so I stuck with them until a few broke off for some extra mileage. It was a really nice route that we took, passing lovely homes and going up and down a few hills. I always get nervous running on the side of the road, but there were plenty of women out that we waved to and the traffic wasn’t too bad. It was great seeing so many women running along the way, and I smiled and waved at all of them! I ended up talking to a really nice woman for a majority of the run who lives in the VA area. She was participating in ZOOMA with her daughter who was up slightly ahead of us. 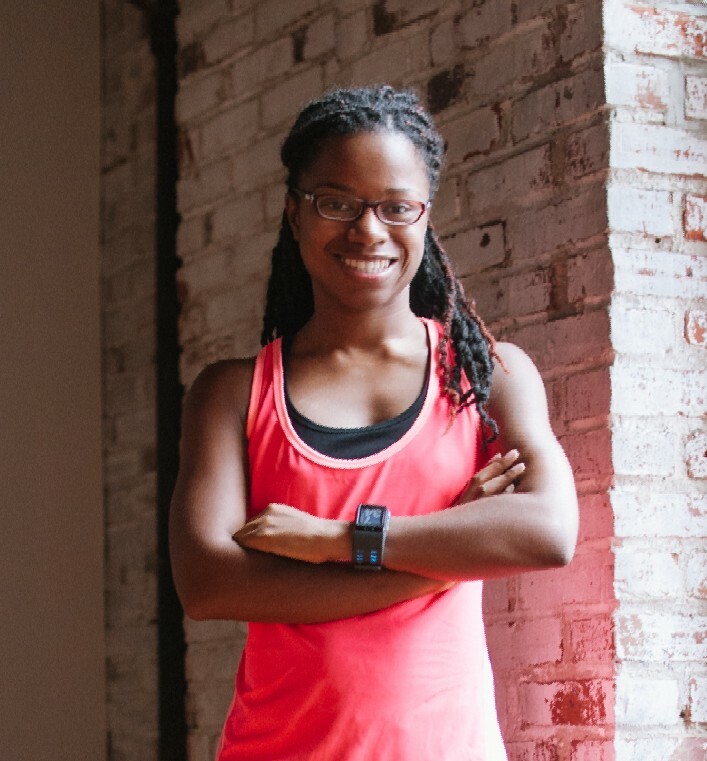 I love getting to meet new people while on a run…I guess you can say I’m a little chatty! It was great running weather, the pressure was off since it was no longer a race, and I felt really good. The trail was beautiful and scenic and most runners were pretty friendly. 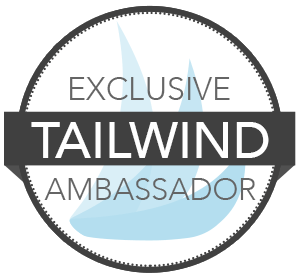 You may also like: Newsletter Debut and a Survey for You! Finally, we were heading back to the hotel and MaryBeth and I ended the run together. She had 6.5 miles while I had a little under 6.2 and finished in about 1:15. After the run, I headed to the “Relax+Chill” section near the beach. There was a musician playing steel drums and there was plenty of recovery food, snacks, and wine. Chair massages were available on the beach, but there was a long line to wait for a massage. I grabbed a few snacks and shivered while I waited for Jennifer to finish her run. Luckily I was able to get a chair massage before time ended. The massage therapist was awesome and got out some knots that I didn’t realize I had. We also had a fun time chatting it up. I just wish the weather was a little bit warmer because I would have loved to lounge on the beach! Jennifer arrived, we had some more snacks, and then headed back to the warmth of indoors to enjoy the rest of the day. Once the Relax + Chill portion ended, the ZOOMA festivities were officially over pretty early in the day on Saturday, so Jennifer and I used that time to sightsee in Falmouth. We went to brunch at Moonakis Cafe which was a really charming place. I had to get the pumpkin French toast…so good! We really feasted on our meal and at a great price! We also drove around downtown and checked out Main Street. What a cute town! We picked up some souvenirs and did a lot of window shopping. It was fun and really felt like a nice fall day. 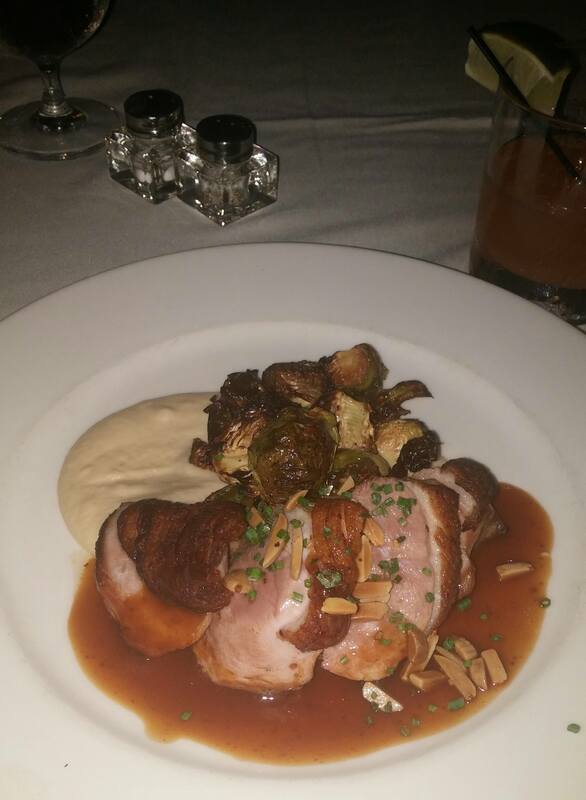 On Saturday night, we went to dinner at The Glass Onion, a really swanky place. I loved the New England decor. I had a very tasty cocktail and went for the duck for dinner. It was delicious! Yes, I was tempted to get the scallops, but who can say no to duck? On Sunday morning, I was due to run 15 miles, so I did my best to get up bright and early so that I could head to the trail and knock it out. Jennifer was kind enough to drop me off at the trail. It was pretty chilly, maybe in the upper 50’s, and it was such a relief after so many weekends of hot and humid (aka miserable) runs. I have to say that it was one of the most beautiful runs that I’ve had. I passed marshes, beautiful homes, and lots of friendly runners and cyclists. I had to stop a few times to take pictures and I don’t regret it one bit! We finished up our time in Falmouth heading to Main Street one more time where we went to Anejo Mexican Bistro for brunch. Yes, I had a watermelon margarita and it was really good! Jennifer took up the driving duties on the way home, and unfortunately, it took a MUCH longer time on the way back. But as always, we had a good time together on the road and I only took one brief nap early in the drive! We got home on Sunday evening and Jennifer had to make her way back home. I’m glad she decided to join me in Cape Cod and I really think she had a good time. Meanwhile, I was wishing I had taken an extra day off! While ZOOMA Cape Cod didn’t turn out the way most of us expected, my sister and I still had a really nice time. Will this be the last ZOOMA Cape Cod? Only time will tell. No matter what happens, I had a great weekend, met some really nice people, and had some very memorable runs! Thanks so much to ZOOMA for allowing me to be a part of this event! Beautiful location. Cape Cod did not disappoint. It was my first time there and I absolutely loved it! Our hotel room wasn’t great, but the beach was really nice and we enjoyed visiting the town of Falmouth. And did you see the pictures I posted on Instagram? Love! Nice swag. While there was no finisher’s medal, we got a tote bag, plenty of free Bondi Bands, a T-shirt, yoga mat, and water bottle. If you had VIP registration you also got a nice, warm hoodie. Free photos! It’s a huge perk to be able to get free, high-quality photos. Bottomless wine all weekend. Barefoot Wine was always “on tap” and I enjoyed every drop! Free massage. I was so lucky to get that free chair massage…it was fantastic! Expensive lodging. The Seacrest Beach Hotel was nice, but for the room we booked, it was extremely expensive and we made our reservation months in advance. Maybe we should have splurged for the better view? Last-minute changes. I was aware that the format of the weekend changed, but I was really disappointed that the runs were essentially self-guided. The initial pace groups didn’t happen, and my sister was not happy about it, for good reason, as it was a big part of her motivation on completing her second ever 10K. VIP vs. regular registration. I honestly believe that those who originally signed up for the 10K should have been given the full VIP treatment. PS – there is one more ZOOMA race happening this year – Amelia Island, Florida on Saturday, October 22. If you’re interested, you can get 10% off registration off the half marathon, 12K, or 5K with code JANELLE16! Have you gone on a girls fitness weekend?